Depression era cooking is a fascinating aspect of vintage recipes. Much of the recipes that have survived are frugal recipes that cook for a family using very little money yet still striving to stay healthy. The others are what I call "make do" recipes that are often in imitation of something that would have been more expensive. Such austere recipes were often tasty in their own right, even if they fell short of what they were trying to imitate. Here is one such recipe, mock tenderloins of course are a frugal replacement for true tenderloin that would have hit the purse hard for someone not making as much as before. This recipe comes from 1930 or 31 and luxuries such as this would be fondly remembered after '32 when the depression was at it's worst. Today we are locked in the Great Recession, sugarcoating what is otherwise a repeat of the last great depression. We've much to learn from these frugal recipes of yesteryear since they are every bit as cost effective now as the were then. Combine first 6 ingredients and mix well. Form into 6 equal balls and flatten slightly to resemble tenderloin fillets. 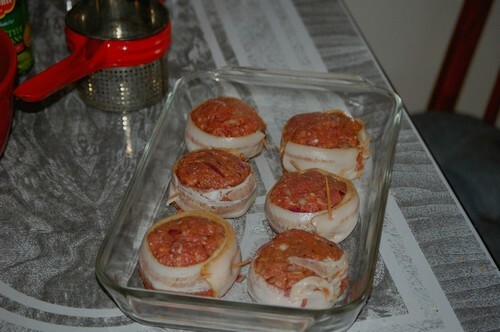 Wrap each with a slice of bacon and secure with a toothpick. Heat oven to 450° and bake 10mins, reduce to 350° and back 30 mins more until bacon is crisp (my bacon was thick cut and didn't work well with the recipe). 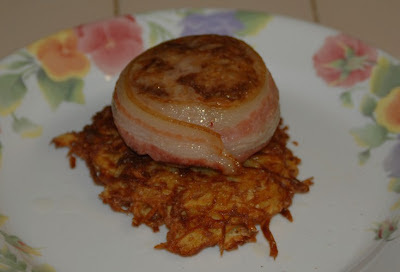 Serve on mashed potatoes or potato pancakes. *Chili Sauce that is available in the store contains High Fructose Corn Syrup (Heinz). I suggest you make your own with organic ketchup. Mix well and store in refrigerator until needed. This looks delicious. Do you happen to have a "city chicken" recipe? It's another ersatz recipe from the same era with ground pork molded into faux drumsticks.